ABSOLUTELY NOTHING (at least as far as collars go)! 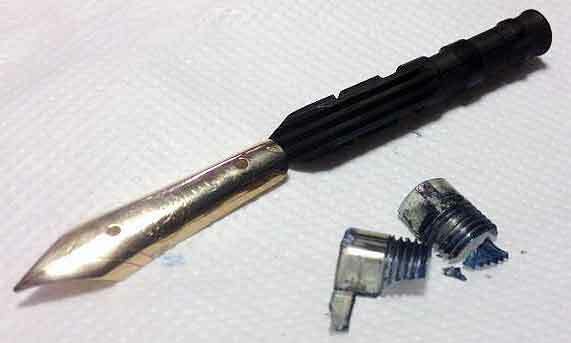 Welcome to the third and final installment of a series of posts dealing with Pelikan’s nibs. The first post endeavored to clarify the presumed meaning of the PF and E|N hallmarks while the second detailed some of the steps in the evolution of the collar, feed, and nib over time. Now you may think that I was overly harsh with my opening statement but allow me to convince you of the truth of that declaration. Polystyrene’s roots are deeply German in origin. It’s initial discovery was in 1839 by Eduard Simon but almost one hundred years had to elapse before the substance was formulated as we know it today. The properties of this material are that it is clear, hard, and (most distressingly) brittle. It began being mass-produced for various applications in the 1930’s and was prized for being relatively inexpensive to manufacture. Fast forward to the early 1950’s as the world embarks on the jet age. High tech plastics and their myriad of uses were all the rage. Pelikan began to manufacture collars from this abundant and inexpensive material. I’m sure it seemed like a perfect application at the time. The problem that has arisen for Pelikan aficionado’s in the ensuing years is that polystyrene is a brittle material. As such, when used as a collar, it is prone to cracking due to the stresses placed upon it. The result of this can range anywhere from undetectable with normal use to a leaking section or an unstable nib and feed. These eventually always declare themselves as a collar failure at some point. Now that I have you worried, lets talk about how to identify one of these collars. Perhaps the biggest give away is the fact that the collar is a clear plastic which is in contrast to the black and, more recently, metal collars. Pens that utilized polystyrene were those produced in the 50’s and 60’s. These would include the 400NN, 120, and 140. These collar failures often give rise to the misperception that a pen has a friction fit nib when the truth is that the collar is actually retained in the section. The easiest way to distinguish this is that if the nib and feed pull out of the section without a collar, this represents a collar failure. 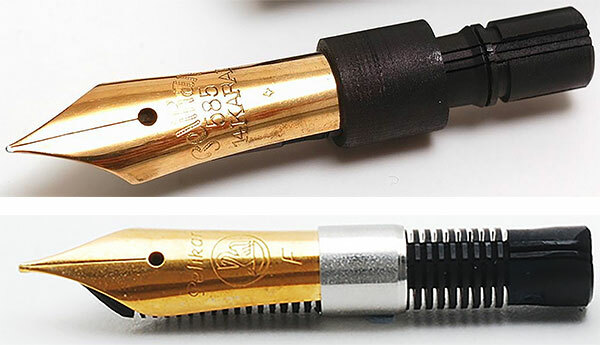 Even a friction fit nib will have a collar, albeit a non-threaded one. Whenever a retained collar is suspected, I encourage everyone to closely evaluate the section to see if any remnants of a collar can be identified once the nib and feed are removed. If a collar is visualized, it can often be removed by inserting a small knife into the section which can act as a screwdriver to allow removal of the collar. 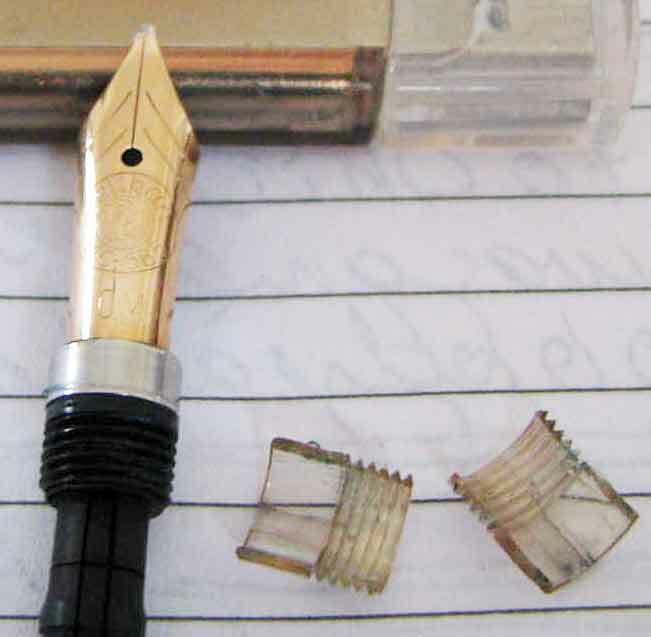 If you have a modern M1xx or M2xx collar available, it can be sacrificed to rehab the now orphaned nib and feed. The link below for Richard Binder’s site will walk you through the necessary steps. I will add that a rat-tail needle file can be had very cheaply from sources such as Amazon.com. If undertaking the described procedure, I would encourage proceeding with care. The mantra should be file, fit, file, fit, file, fit, and done. This way, a good fit is ensured without overdoing it. I have employed this method with success in the past. Finally, I will say that do it yourself repair is not for everyone, nor should it be. Given the age of these collars, Chartpak is not likely to service them but it is my understanding that Pelikan in Germany will replace these for a nominal fee if any charge at all. If you’re interested in contacting them for a quote, that form can be found here.